The risk and adrenaline rush of skydiving can heighten the feeling of being alive. 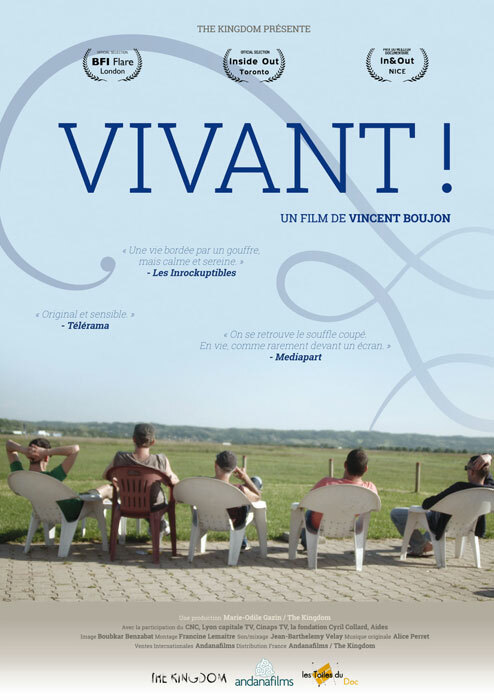 In this compelling documentary, five HIV-positive gay men spend a week preparing for their first solo parachute jump. The camaraderie inspired by the rigorous training and team-building exercises encourage the men to share their feelings about being seropositive: their reactions to finding out, their thoughts about ongoing treatments, and the ways they negotiate relationships with men who are not positive. But as the skydiving day approaches, doubts emerge. Will they all make the jump? Filled with humour and breathtaking aerial photography, Alive! reminds us all of the value of life and of living it to the fullest. Ce DVD est disponible au prix de € 19,95 TTC (hors frais de livraison). Cliquez sur le bouton ci-dessous pour ajouter ce DVD à votre commande. Le prix est 50€ TTC pour un 52 minutes et 60€ TTC pour un 90 minutes. Par droits institutionnels, on entend : utilisation du DVD au sein d'associations et d'organismes publics ou privés à vocation culturelle, éducative, sociale, à caractère non lucratif et hors projections publiques. Ces droits autorisent également le prêt individuel gratuit pour visionnage à usage privé dans le cadre du cercle de famille. Do you plan to show this film to public ? Please contact us. AndanaFilms is a distribution company dedicated to celebrating creativity and innovation. Since the beginning we have tried to build a strong relationship with filmmakers, and focus on working hand in hand with them on the financing front – to help secure funds and prebuys. Our editorial line consists of one-hour programmes in the fields of society, politics, history and art, and feature length documentaries with an international scope.